Creativity is in the air at The Big Fish Grill Issaquah. On the fourth Wednesday of the month, aspiring artists and newcomers alike flock to Big Fish’s private dining room for Corks and Canvas Events paint parties. These popular events combine painting and wine, making them a hot ticket. For more than five years, the locally-owned Corks and Canvas Events has been bringing people together to reconnect with their creative selves. 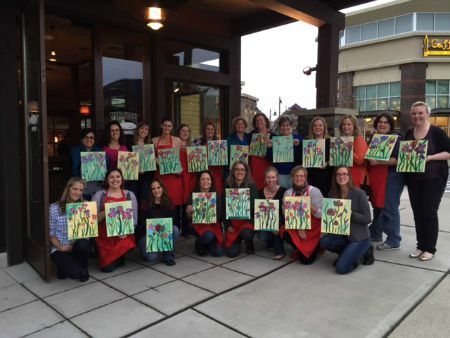 At each party, Corks and Canvas Events provides all the supplies and step-by-step expert instruction for painting a personal masterpiece. A glass of wine or beer is included in registration, making it a fun “paint and sip” evening. No experience is required. At the end of the party, everyone goes home with their own painting. There’s no drawing involved and quite simply, no wrong way to paint. At The Big Fish Grill, participants gather in the private dining room to begin instruction at 6 p.m.—or earlier in the bar to enjoy Happy Hour, where a bowl of their famous Clam Chowder is only $3. It’s a popular destination for birthday celebrations, showers and Girls Night Out. Originally conceived as a way to bring people to local tasting rooms, Corks and Canvas Events parties have grown to more than 30 events per month at venues across Washington. In fact, they had to reduce the size of each canvas from 16 by 20 inches to 11 by 14 inches. The reason? Paint party regulars ran out of wall space to hang their art. Click here to read full article on the Macaroni Kid.